Guy Rictcie’s latest movie is an adaptation of once famous TV series with same name that was aired in 1960’s. However, apart from the names of the leading characters which have been played by Henry Cavill, Alicia Vikander, Armie Hammer, Elizabeth Debicki, the director has taken little from the show. The movie, which has nothing new or brilliant to offer but is full of a lot of style and fun, was released in theaters on 28th Aug 2015. Set in 1963, the movie tells the tale of Napoleon Solo (Henry Cavill), an American Spy, who is forced to work with Illya Kuryakin (Armie Hammer), his Russian counterpart. The reason behind the coming together of the two cold war era spies, working on the opposite sides is the kidnapping of a German nuclear scientist by a mysterious international criminal organization. The only lead that the two spies have is the daughter of the kidnapped scientist, with whose help they can infiltrate the criminal organization. The two spies have very little time to stop the organization from destabilizing the fragile power balance by mass production of nuclear weapons and technology and prevent a global catastrophe. Guy Ritchie needs to be applauded for creating an intelligent spy movie that balances action and thrill with good old commonsense. The magnificent cast of the movie has also proved effective in bringing alive the old world characters, who while dressed in sharp suits could kill both with their words and their weapons. The biggest drawback of the movie however, is its paper thin script which lacks any elements of surprise and twists. 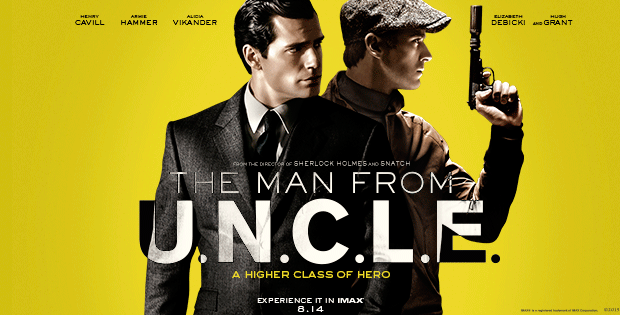 Overall, the movie is a good one time watch spy action film that also has some nice comic moments and IndiaCafe24 gives The Man From U.N.C.L.E. a rating of 3.5 stars. TOPICS Action & AdventureAlicia VikanderArmie HammerComedyElizabeth DebickiGuy RitchieHenry CavillMystery & SuspenseThe Man From U.N.C.L.E.